One classic that you can always count on happening sometime during the holiday season is an ugly Christmas sweater party. These parties are probably one of the most fun celebrations during the holidays because everyone looks so ridiculous. Not to mention, they don’t come with the extra stress of finding some beautiful, glamorous dress like other holiday parties do. However, there can be some minimal stress when it comes to finding the perfect ugly Christmas sweater given all of the options out there. Do you want to go with funny? Or heinous? Or maybe you want something more Grandma-esque? Stores carry so many different kinds that you’ll easily be able to find what you’re looking for. But, if you’re in the mood to have a one-of-a-kind-ugly Christmas sweater, then stop searching the local thrift store and head to the nearest craft store ASAP to make your very own do-it-yourself ugly Christmas sweater! Here are some of the DIY ugly Christmas sweater ideas you need to try this holiday season. This DIY Christmas sweater is so easy to make! 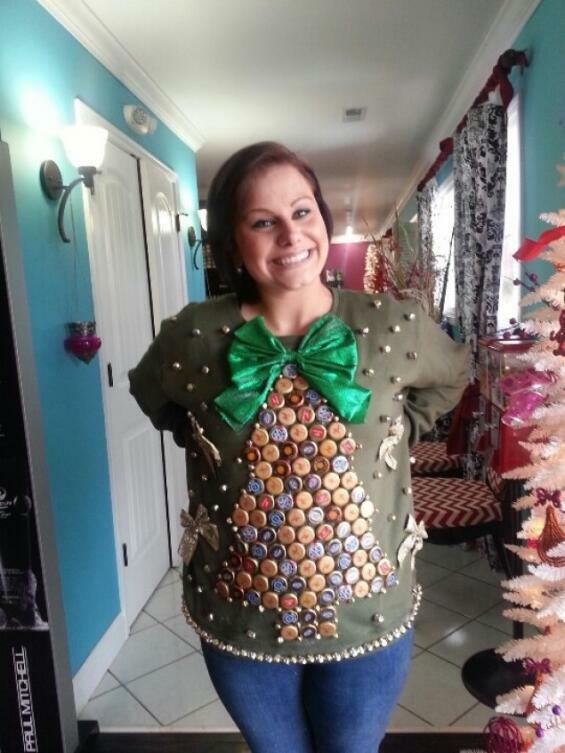 All you need for this sweater is bottle caps from your favorite beer bottles, some jingle bells, ribbon and hot glue. First, before you glue anything, you’re going to want to arrange the bottle caps into the shape of a Christmas tree in the middle of the sweater. This way you’ll be able to get the right shape before you make anything permanent. Once the caps are in the desired shape, glue them on. 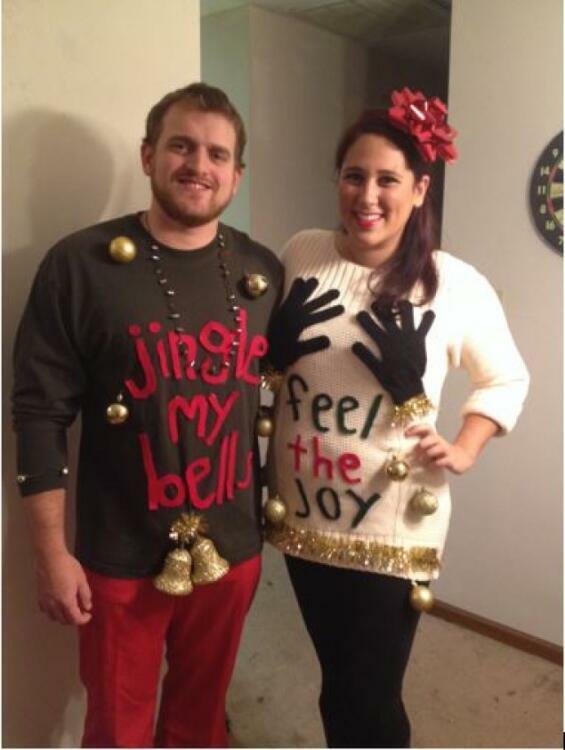 Next, you’ll want to glue on the jingle bells. Feel free to add as many or as little as you want all over the sweater. The more jingle bells, the more festive you’ll be at whatever party you’re attending. Finally, tie your ribbon into a couple of bows. Put one on top of your bottle cap Christmas tree and then put the rest wherever you want to finish off this sweater. You’re not likely going to find an inappropriate ugly Christmas sweater at the thrift store, so if this is the kind of sweater you’re looking for, making it yourself is your best bet. This sweater is pretty simple to make. The only materials you’ll need are a plain sweater, a pair of winter gloves, some tinsel, a couple of ornaments, felt and some hot glue. Start with gloves and hot glue them to the chest area of the sweater. The idea is to make the gloves look as inappropriately placed as possible, so make sure you get them in the right spot before gluing. Then, using the felt, you’ll want to cut out all of the letters you need for the saying “feel the joy.” Center this saying on the front of the sweater in the middle, right under the gloves. Last but not least, finish off your sweater by decorating with the tinsel and ornaments. The more decorations, the better. And voila, you have your naughty Christmas sweater! No one at your holiday party will be able to look at this sweater and not laugh. This sweater is all about putting a punny twist on the saying “happy holidays” and it is yet another simple do-it-yourself ugly Christmas sweater. This sweater is still funny, like the naughty DIY Christmas sweater, but it’s a little more appropriate so you can wear it at any holiday party, with friends or family! For this one, all you’ll need is a plain sweater, felt for the letters and 2 tacky, large gold chains. 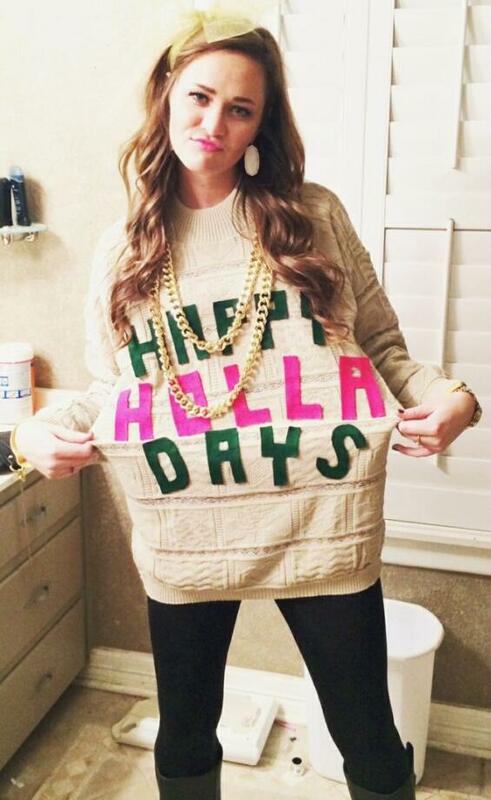 Using the green and red felt, cut out the letters to say “happy holla days.” Center them and then glue them to the front of the sweater. Finish your look off with the tacky gold chains and you’ll have a rapper inspired holiday look a la 2 Chainz. You may have endless options of ugly Christmas sweaters at your local thrift shop, but why not go a different route this year? A DIY Christmas sweater is a super simple alternative to going out and buying one, not to mention cheaper. All they take is a trip to the craft store and a little bit of effort. These do-it-yourself Christmas sweaters are the easiest way to look fun and unique at your next holiday party!